After settling into our downtown hotels, the Educational Passages team attended Bill Nye’s keynote speech at the LA Convention Center. 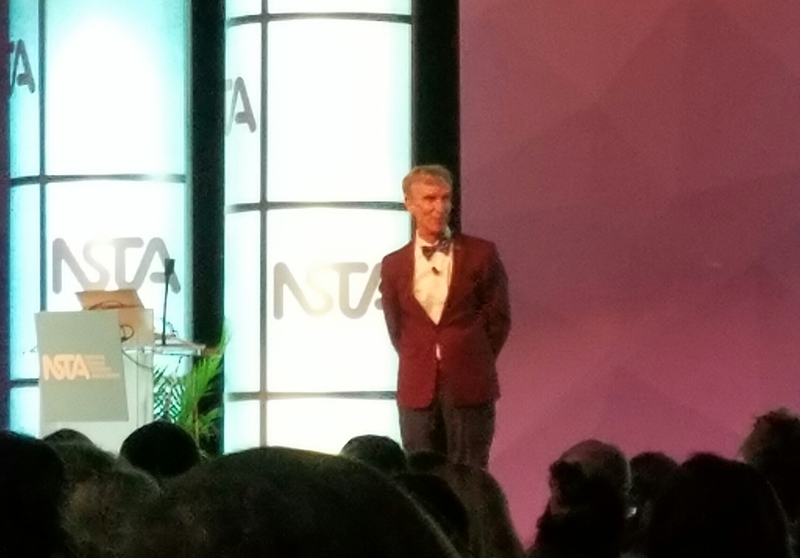 In between the humor and science, Bill spoke directly to the educators, asking them to prepare the next generation for massive environmental challenges across the world. He wants Generation S (“S for Science!”) to use scientific reasoning when addressing everyday situations. He wants them to be technologically literate and innate problem solvers, inquisitive researchers and international leaders. Bill set the tempo and 12,000 educators kept the beat. Teachers from across the world connected, shared, and learned. All were on a mission to expand opportunities for their students, to invest in the next generation. The many educators interested in our global ocean literacy program need affordable and aligned resources to connect their classrooms to the world. Educational Passages is proud to be working with such a passionate, engaging, and innovative community. We introduced Educational Passages with our mission to achieve global ocean literacy. 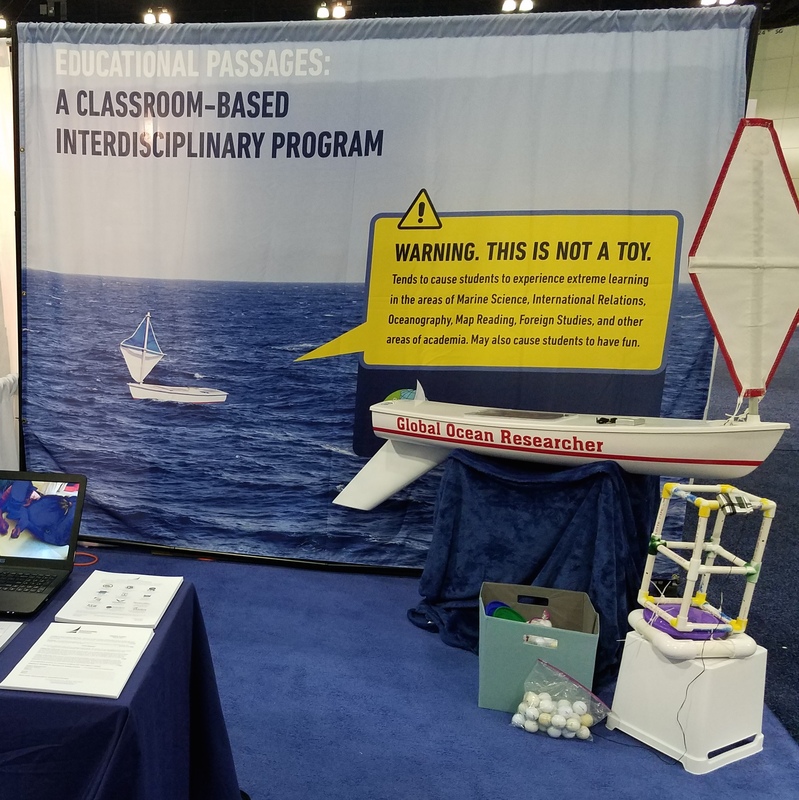 Our Project Manager, Brad Janocha, presented a National Marine Educators Association (NMEA) Share-a-thon Session: Students Study the Seas: in-classroom STEM oceanography projects inspire global awareness and science literacy. This session gave Educational Passages an hour to expand upon its message and outline our 2017 goals. At our booth, we invited educators to join our international educational community. The reception was phenomenal. Some teachers want to collaborate on curriculum and contribute lesson plans. Others want to start their own mini-boat program or participate in the upcoming Pacific Challenge. All care deeply about the ocean and want to connect their students to this essential and shared resource. To assist educators and achieve our mission, we are developing aligned lesson plans to contextualize our mini-boat program. Educational Passages used the three dimensions of NGSS to plan our comprehensive ocean literacy program. The lessons will be grounded in Earth Science, Physical Science, Life Science, and Engineering/Technology, but framed by oceanic phenomena and exploration. The goal is to develop a resource compliant with modern standards that can be used to expand ocean literacy. Educators interested in utilizing these lessons or contributing to the program should contact Brad Janocha at brad@educationalpassages.org or add your email to the contact list at the bottom of this page. NSTA17 connected our team to educators across the world. We are excited to expand our program and community. Together, we can attain global ocean literacy.